New parents want to ensure that their children are getting the proper nutrition. They also want to be sure their newborn has properly functioning intestines. For these reasons, many parents monitor the food intake and stool output of their newborn. 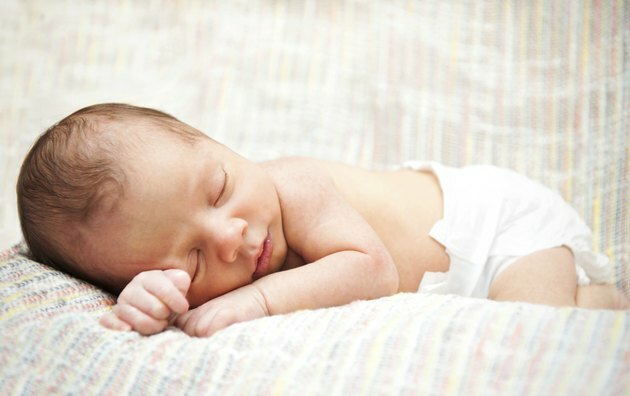 A decrease in a newborn's bowel movements can be very scary for a parent. There are several possible explanations for why a newborn is not having bowel movements. First, a parent must understand the normal frequency of newborn bowel movements. If you suspect your newborn has deviated from this pattern and is suffering from constipation or a bowel disorder, you should contact your pediatrician immediately. Newborns that are breastfed have soft and runny stools. Babies that are formula fed have firmer, but still unformed stools. Newborns can have as many as 8-10 bowel movements a day. However, as long as your baby is having one movement a day, there is no cause for concern. Keep track of how much your baby is eating, as this sheds light on how many bowel movements she should be having. If your baby has a swollen belly, has not had a bowel movement for several days and is uncomfortable, you should consult a physician. Constipation can happen when a baby is switched from breast milk to baby formula, or from one type of formula to another. This usually resolves on its own. However, if your child is not ingesting enough fluid or has not had a bowel movement for several days, he may be constipated. If this is the case, do not feed your newborn anything other than breast milk or formula unless directed to do so by your pediatrician. Depending on the age of your child and the severity of the issue, your pediatrician may prescribe a laxative or suggest a change in formula. Hirschprung's disease is a defect in the nerve cells that in the intestines. These nerve cells tell the intestine to push stool out. For this reason, affected newborns can not regulate their stool movements and may develop severe constipation. This disease is present from birth. Symptoms include constipation, poor appetite, vomiting and diarrhea. To determine if your baby suffers from Hischsprung's disease, your physician may need to take X-rays and possibly perform a biopsy. As your newborn ages, her bowel movements will change. After one or two months, many newborns go from having several bowel movements a day to having several days between bowel movements. This can be completely normal. The color and consistency of your baby's stool can also change with time and with the introduction of different foods.